These days that I almost non-stop cook (and food-photograph and food-blog) I always have some dried beans soaking somewhere, ready to be cooked and used in some salad and or dinner. I must say that many of my bean dishes that I have tried int he last few months have become regular dishes here. They taste great, can be combined with just anything, and on top of all that are so healthy and nutritious. I love hearty soups and stews in winter, especially when beans are involved. Now in winter it is just the perfect time to make a big pot of soup that gets better by the day (not that our stews would ever have a chance to get that old). 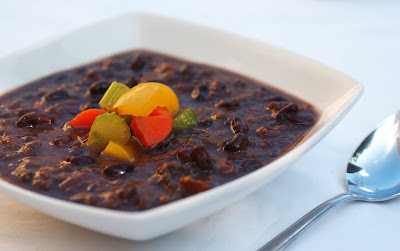 This recipe here is loosely based on the Black Bean Soup from Simply Recipes. I replaced the ham hock by bacon, simply because the pork selection here in the Middle East is somewhat limited. The original recipe was asking for molasses which I tried once and did not like. I omitted it completely. To me the cumin and the chili do all the work in this soup and make it a lovely spicy soup. The bacon gives it a wonderful smoky taste that goes really well with the beans. As most bean stews, it takes some time to prepare. But as these dishes get better the next day, it may be wise to prepare them in advance. I know for sure that this bean soup will be a regular dish in this house too. Soak the dried black beans in 4 cups of water for at least 6 hours or overnight. Rinse and drain. Cut the bacon into small pieces and cook in a heavy-bottomed pot over medium heat for about 5 minutes. Add the black beans, 5 cups of water, bay leaves and 1 teaspoon of salt. Bring to boil, then simmer covered over medium heat for 1 hour to 1 hour 30 minutes or until beans are tender. Heat olive oil in a big pan. Over medium heat stir in onions, sweet potato, carrots, celery and salt. Cook until vegetables are softened, about 10-15 minutes. Add spices and the garlic and keep stirring for 1 or 2 minutes. Now combine the complete bean and bacon mixture to the vegetables. Add chicken/vegetable stock and bell pepper. Bring to boil, then simmer on low heat for another 20 minutes. Remove about one third of the soup and blend it to a puree before adding it back to the soup. Serve hot with sour cream or yogurt and chopped herbs like parsley or coriander.